De nada… 😉 This was the first year I caught the entire first stage. They were so inspiring — I loved seeing and hearing all of them! Thank you for posting this. What a wonderful tradition. 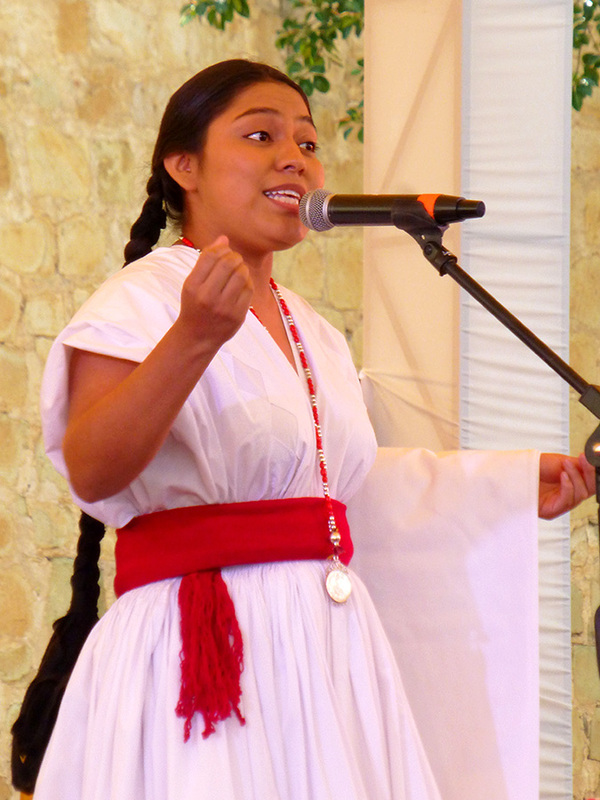 The winner gives a welcoming speech (without notes) at the Guelaguetza Auditorium in front of thousands at the start of each of the 4 performances and everyone said Rebeca was fabulous — strong, proud, and articulate. Such extraordinary beauty. Thank you for this post. Thank you. A large part of the beauty of Oaxaca is her people. Do you have any videos to share? I’m sorry, I don’t. You may be able to find something on YouTube. Does this contest happen in the very beginning of the festival. I want to come next year! Yes, usually the Friday before the first Monday Guelaguetza. It’s a great time to be here. For two weeks, besides music, costumes, and dance, it’s non-stop food festivals, artisan ferias, concerts, and more!